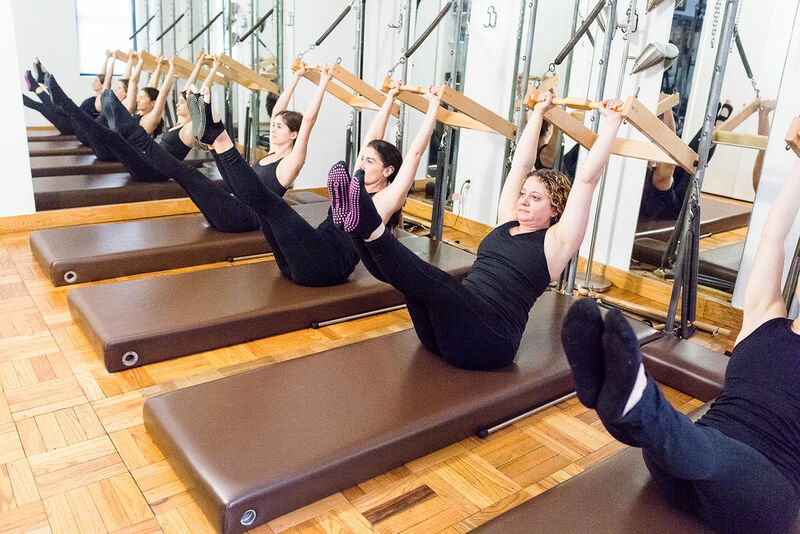 It is a 45-minute Pilates class that is limited to 4 students. These classes focus on the mat system. The class may include some Pilates props, such as Magic Circles, Bands, Balls, and Rollers. Please consult your instructor when interested in changing class levels. It is important that you attend the appropriate level for your ability. Everybody’s process is different. It is a 45-minute class that is limited to 4 students. The focus is on using the Studio Wall Unit, or Tower Unit. The tower unit has all the capabilities of the traditional Cadillac equipment. 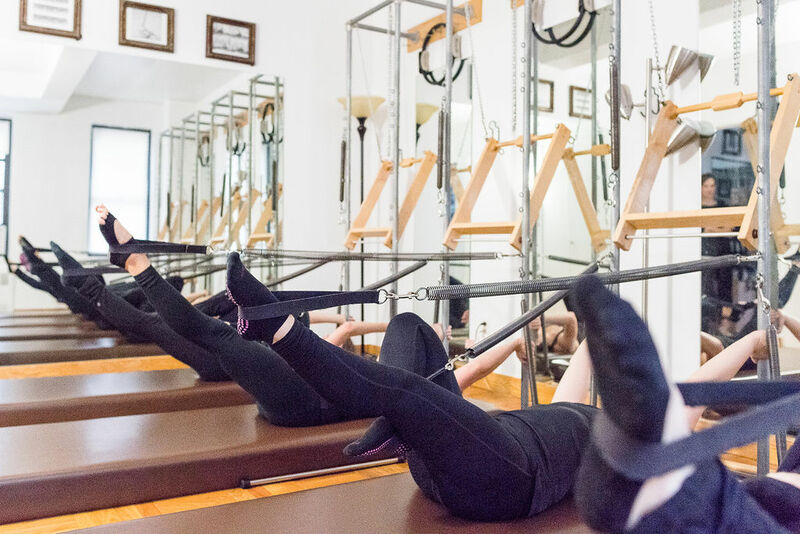 Joseph Pilates created the equipment to help you strengthen your body, allowing you to achieve greater flexibility and control. A private session is recommended before entering this class but not required. Please consult your instructor when interested in changing class levels. This Pilates class is for those who are new to Pilates or have less than 3 months experience. A beginner system is taught in this class, as well as some Pre-Pilates exercises and fundamentals. Modifications are given to those who need them. It is important to build a solid foundation in the beginning. Staying at this level for a while is highly recommended. Learning to move from your center, focusing on body alignment, and control are the main focuses in beginner classes. This class is an open level class. All levels are welcome. After mastering the Basic level class, the Level I class will be the next step. Previous Pilates experience is a must. Beginning intermediate exercises will be taught at this level. While continuing to focus on body alignment, control, and precision, you will perfect the beginner exercises while learning intermediate exercises. This is an intermediate Pilates class. This class will focus more on flow, breath, and moving through each exercise without stopping. A solid understanding of the beginner/intermediate exercises is expected at this level. If you are dealing with an injury, please consult the instructor. You may need to modify a lot of these exercises, therefore making this class, not the appropriate level for you. This is an intermediate/advanced class. Injury free only. Permission by the instructor only. The focus of this class is flow, breath and movement through each exercise without stopping. This class will introduce Level III exercises with more attention to detail. A solid understanding of the intermediate exercises is expected at this level. This is recommended only for students who have a lot of previous experience and are injury free. This class progresses through an intermediate/advanced series. Be prepared to sweat! The focus is on all 6 principles at the same time: centering, control, concentration, breath, flow, and precision. Advanced exercises will be introduced and perfected at this level. This is for clients who have have practiced Pilates for years and/or have been approved for super-advanced Pilates work. Working with different tempos, flowing movement, more repetition and advanced mat exercises. This class will focus on more over head work and upper body work. If you have an injury, this is NOT the class for you. This class is geared for students aged 55 and older with special emphasis on how basic mat and tower exercises work on a mature body. Pilates will be made safe for those who may have certain conditions that occur with age with modifications given as necessary. Standing balancing exercise will be highlighted. Students will learn how to safely enter a group class situation. This is a stretch class!! !Stretching is a crucial part of any exercise routine that improves flexibility, skeletal alignment and reduces stress. This class will incorporate the best of Pilates and yoga (possibly using props) to stretch parts of your body you never knew existed. You will leave feeling relieved of muscular tension and daily stress. There is a 24-hour cancellation policy on all scheduled appointments and group classes. If you fail to cancel within this period, you will be charged the full amount. Please understand that we must enforce this policy strictly. Our instructors are compensated on a per-client basis and have made a time commitment to our studio. We thank you for respecting this policy. There are no exceptions. All intro packages expire within 30 days. All sessions and group classes are offered in a package of 5 or 10 at a discount. All packages of 5 expire within 2 months and packages of 10 expire within four months from the date of purchase. 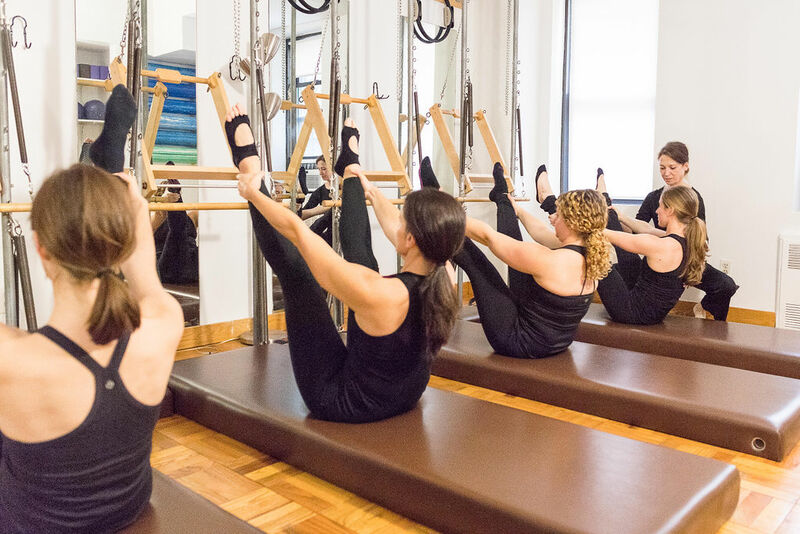 Cards are transferable for use at the Pilates Movement’s NYC Pilates studio only, and are non-refundable.